Pizza has to be one of my favorite things to make. I don’t post as many pizzas as I make but I realized I haven’t done a pizza post in a while. Bacon is great on anything and the potato adds a nice flavor different than your typical pizza and caramelized onions lends a little sweetness. Roasting the garlic instead of using raw mellows out the flavor but still adds a garlicky kick. Enjoy! Melt butter in a small saucepan over medium heat. Add flour and whisk to combine. Continuing to whisk, add the heavy cream and heat for about a minute. Continue to whisk mixture to avoid any lumps. Remove from heat and add roasted garlic, parmesan cheese, and salt. Let mixture cool before topping pizza. Cut bacon and small strips and cook until just done. Bacon will continue cooking in the oven. Drain bacon and remove bacon fat from pan leaving just enough to coat. Peel and thinly slice potato. Add to the pan with bacon fat and season with salt and pepper. Cook over medium heat for approximately 10 minutes. Remove from pan once done and set aside. 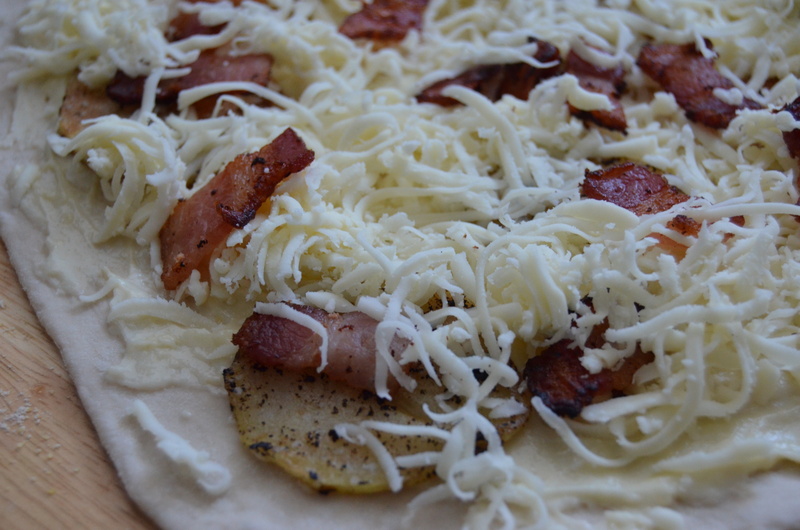 To assemble pizza, spread cooled roasted garlic cream sauce on and top with potatoes. Top with mozzarella cheese, bacon, and caramelized onions. Cook pizza on a preheated pizza stone at 500 degrees until pizza is golden brown and bubbly. You can’t go wrong with those ingredients.